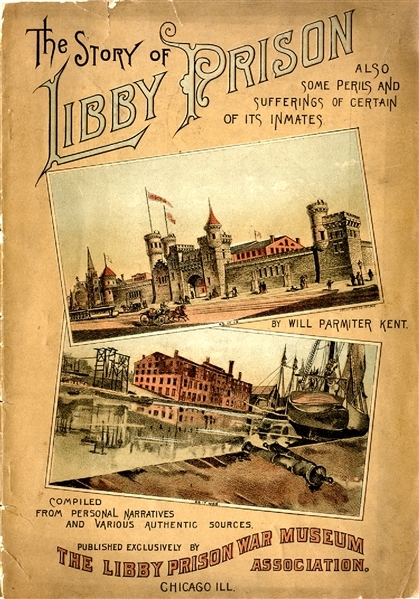 Booklet, 6” x 9”, “The Story of Libby Prison, Also Some Perils and Sufferings of Certain of its Inmates”, by Will Parmiter Kent, Published by The Libby Prison War Museum Association, Chicago, 1891).64pp., plus searate color cover, VG. Compiled from personal narratives and various authentic sources. Includes a preface and 13 chapters, including The Romance and Reality of War and 12 others about the history of nearly every aspect (physical and otherwise) of Libby Prison. "Libby Prison was a Confederate prison at Richmond, Virginia, during the American Civil War. It gained an infamous reputation for the overcrowded and harsh conditions under which officer prisoners from the Union Army were kept. Prisoners suffered from disease, malnutrition and a high mortality rate. By 1863, one thousand prisoners were crowded into large open rooms on two floors, with open, barred windows leaving them exposed to weather and temperature extremes.